As the market leader in collaborative robotics, Universal Robots is making automation easier and more accessible than ever. Through its innovative Universal Robots+ marketplace, UR provides a one-stop shopping place for end effectors, accessories, and software certified to be high quality, simple to install, and easy to use on any UR cobot. Many manufacturers of grippers and other accessories are exceptionally skilled at designing their products. However, one of the largest barriers to entry into UR+ is the software component known as the URCap. This is where Robot27 can help. By partnering with Robot27, your company not only gains the software expertise necessary to design an easy-to-use interface optimized for your product and UR’s own programming software, but also finds a helping hand through the UR+ certification process. Robot27 guides its customers through UR’s software and hardware verification process from initial URCap design to final software and hardware testing at one of UR’s facilities. Our insight into and knowledge of UR puts your product on the fasttrack to accessing the UR+ global marketplace. Call us at 855-762-6827 to learn how we can help your development effort. First steps include establishing a written scope of work and concept review with UR before programming begins. Once your product is successfully launched, Robot27’s support services kick into gear. From revising and adapting the software component of your UR+ product for new product features, UR robot software updates and changes, and more, Robot27 provides the help you need to ensure your product remains in top condition. Since 1992, Robot27’s principals have designed customized software for a wide range of industries, including manufacturing, engineering, oil and gas, architecture, and retail. Thousands of users over 25 years have shown us how a well-designed user interface can make or break an otherwise successful project. Sometimes, integration projects require custom URCaps to more easily solve complex programming problems. 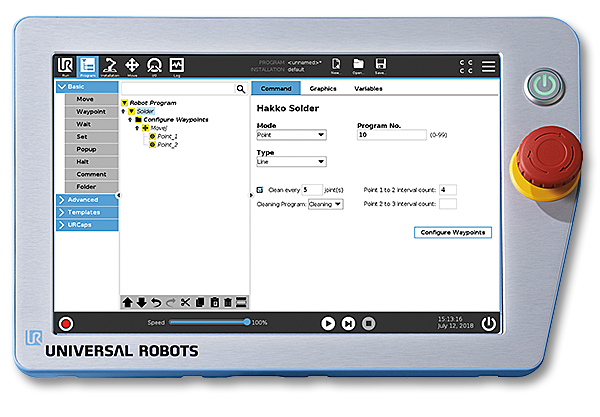 From customized and flexible paletizing routines to hardware control and more, Robot27 designs and supports customized URCaps for integrators, too. Please call us for more details.